About 70 percent of fine dust particles found in South Korean skies come from neighboring Northeast Asian countries such as China, a recent study shows. According to an analysis of the state-run Korea Environment Institute, up to 70 percent of Korea’s fine dust particles and other airborne pollutants originated in China and other Central Asian countries like Kazakhstan and Mongolia. The study was conducted on a total of 254 days between 2001 and 2008 when Seoul’s ultrafine dust particle concentration was at 100 micrograms per cubic meter or higher. Since the arrival of the New Year, a thick toxic haze has blanketed most of South Korea, prompting local authorities to advise people to stay indoors. The weather agency’s data showed the air condition in Seoul and the surrounding Gyeonggi Province on Tuesday afternoon to be “bad,” in its four-scale system of good, normal, bad and very bad. Ultrafine dust advisories, issued for most parts of the country on Monday, were lifted on early Tuesday morning. Researchers at the KEI pointed out that the Korean Peninsula is under the influence of air pollution in China and Mongolia due to northwesterly wind. They added that three Chinese provinces, adjacent to Korea, topped the list in China for high fine dust emission levels. 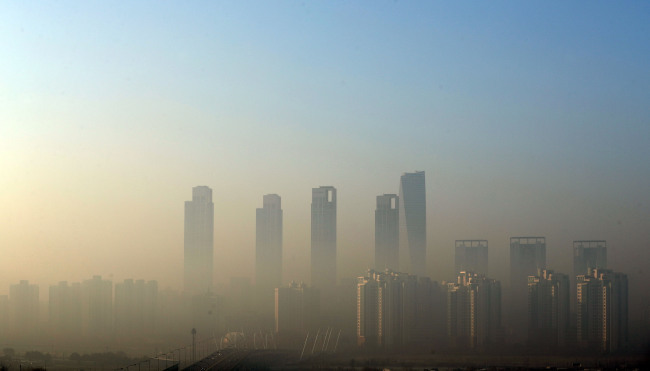 A 2006 study jointly conducted by NASA and environmental experts in China showed that Shandong Province were releasing 1.7 million tons of air pollutants annually, followed by Hebei Province with 1.3 million tons and Jiangsu Province at 1.2 million tons. “These three provinces, all located not so far from the Korean Peninsula, are known for being heavily populated areas with a high number of automobiles and big factories. They emit an enormous amount of air pollutants each day,” said Lee Seung-min from the KEI, who participated in the research. Jang Im-seok, head of KEI’s Center for Environmental Assessment Monitoring, stressed the importance for cross-border cooperation to improve the air condition in South Korea. “The current fine dust problem in Korea is difficult to be resolved within a short period of time. That is why it is important for the government to come up with regional cooperation measures in eradicating air pollution and to have China involved in such joint efforts, noting air pollution has no boundaries,” he said. In June last year, the South Korean government released a set of fine dust countermeasures amid growing public anxiety over health risks linked to air conditions. The government has set a goal to improve the country’s air quality to levels equivalent to those of European countries in 10 years. The government said that it aims for an average dust concentration of 18 micrograms per cubic meter of air by 2026, from the current 23 micrograms. According to the Environmental Performance Index 2016 rankings, South Korea ranked 173rd out of 180 countries in terms of air quality, scoring 45.51 out of a possible 100. The country was one of the poorest performers among Asian countries.